With our work on palm oil in the Congo Basin we aim to highlight that large-scale development projects must not overshadow forest peoples’ rights and environmental sustainability. In other parts of the world, particularly Southeast Asia, the cost of industrial palm oil production to forests and peoples has far outstripped its benefits. We must not let this happen again in Africa and elsewhere. The forests of the Congo Basin cover approximately 200 million hectares, host a wealth of biodiversity and store an estimated 25-30 gigatonnes of carbon. They also provide direct livelihood benefits for over 40 million people, including an estimated 500,000 indigenous forest peoples. Despite this, governments of the region are welcoming the investment of palm oil companies to open new plantations. The growth of large-scale palm oil production represents one of the main emerging threats to rainforests in Central Africa. 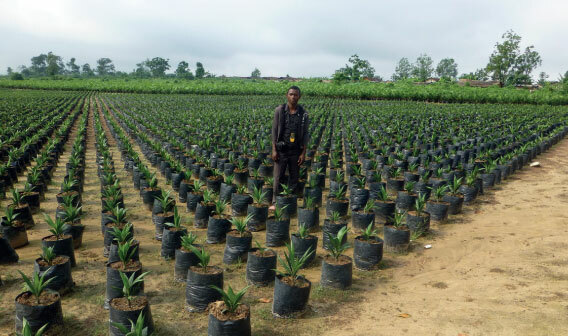 Some palm oil producers are looking to aggressively expand their operations in West and Central Africa. Governments support this, seeing agro-industrial expansion as a means to foster development. The growth of commercial oil palm plantations has been a major driver of deforestation, destruction of indigenous lands, loss of biodiversity, and creation of carbon emissions. It has also resulted in social conflicts and the loss of rights over territories by local and indigenous communities. Focusing on the Congo Basin, we are working with local partners to investigate the impact of palm oil plantations and other industrial developments on both local communities and the environment. RFUK has played an important role raising awareness of the imminent threat of palm oil expansion in the Congo Basin, mainly through the dissemination of the report Seeds of Destruction: Expansion of Industrial Oil Palm in the Congo Basin; Potential Impacts on Forests and People. This report highlights the fact that in Congo we still have time to prevent the social and environmental tragedies that South East Asia has experienced due to industrial palm oil production. We are investigating large scale agro-industrial developments in the region in order to assess their social and environmental impacts on the ground, as well as the gaps in the implementation of national laws and international standards. With this, we will look to inform national and international stakeholders, notably governments, international organisations, the private sector and civil society, and to provide concrete recommendations on ways to harness these projects so that they truly foster local development, uphold rights and protect the environment. A key part of our approach involves supporting our local partners in the region to develop their own advocacy strategies and put these into action. The cultivation of palm oil at an industrial-scale has wreaked havoc with the rainforests and forest peoples of South-East Asia and is now threatening rainforests in the Congo Basin. This 2013 report, the result of original research commissioned by The Rainforest Foundation UK, lifts the lid on the new expansion of oil palm developments in the Congo Basin.